Usually, when a lion gets inside a tourists vehicle, it ends in a death such as in the case of the Game of Thrones editor who was mauled by a lion while on safari in Africa. 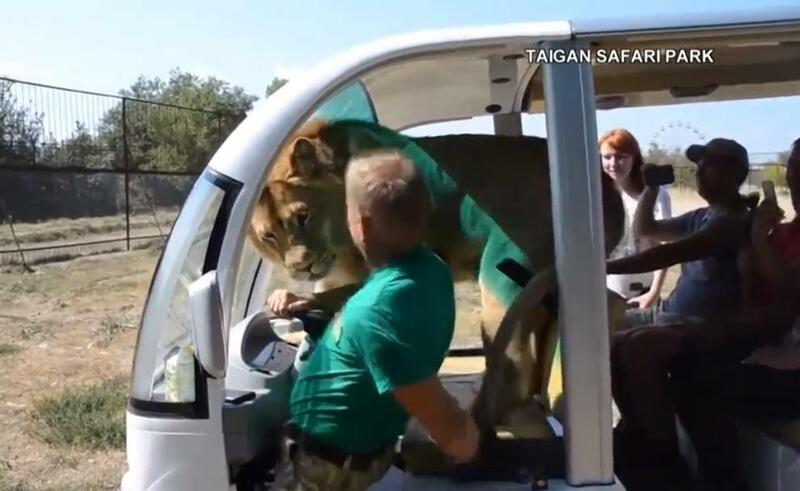 But visitors getting a tour at a safari park in Vilnohirsk, Crimea had a different experience entirely when a full grown male lion jumped into the open safari vehicle. Instead of attacking, the lion appeared to be playful and only wanted to give some kisses to the tourists. The moment when the lion jumped into the safari vehicle was caught on video and is going viral. The lion's name is Filya and seemed very gentle as he climbed all over the seats of the vehicle. Just weeks before the video was taken, another incident left a woman injured by a different lion at the same park. Taigan Safari Park in Crimea is known for allowing its visitors to get in close proximity to its captive lions. Look at the idiots still using their smart phones and cameras.. … Hey idiots it is not a force field barrier.